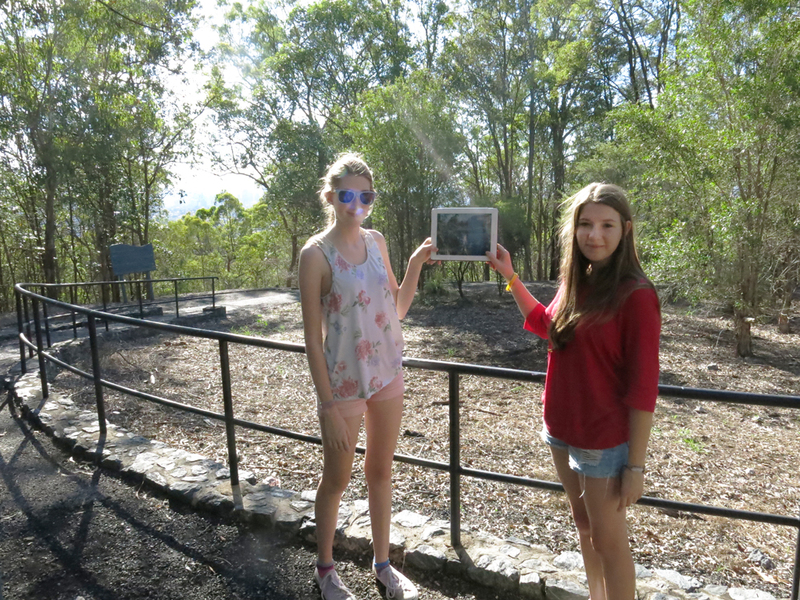 We climbed Whites Hill in Brisbane to visit the camera obscura, price of entry sixpence, one penny for children. We were disappointed to find it wasn’t there. Apparently it hasn’t been operating since 1928, some kids last saw some remnants attached to the dilapidated tea-rooms in the 1940s, all we found was a council plaque. In the 20s it had a 360 degree rotating periscope in the roof of a two storey tower projecting an image onto a viewing table 9 feet across, which viewers saw from a surrounding mezzanine balcony. 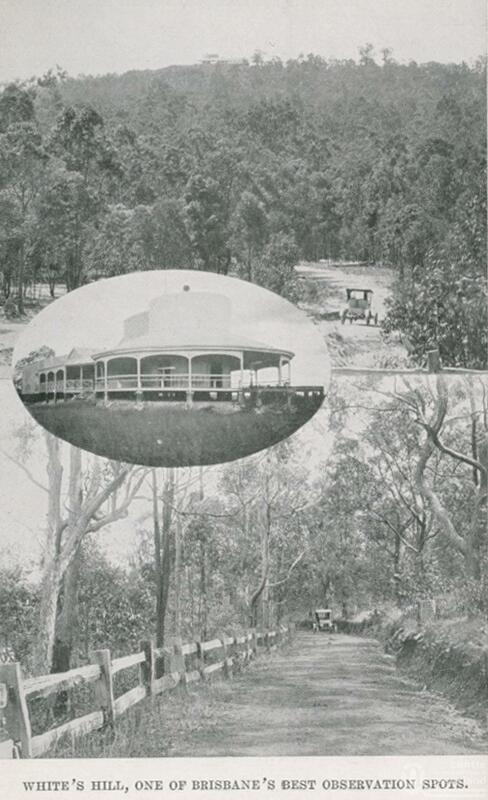 My source, Judy Rechner’s Where Have All The Creeks Gone: Camp Hill Heritage Drive Tour, published by the Brisbane East Branch of the National Trust of Queensland, says that the viewing table was conical, perhaps to keep the whole field of view in focus because of the periscopic optics? I seem to remember that the Edinburg camera obscura and Santa Monica camera obscura had tables that tilted, perhaps for the same reason of different points of focus across the width of image? Whites Hill isn’t all that high, but when you get to the top you can see why a camera obscura would have worked there, with the city to the west and Moreton Bay to the east, and flatness in between. The trees have all grown now, obscuring most of the view, except for a gap towards the city helpfully left by the council to frame the distant towers. This scopic vector was the only real remnant of the Whites Hill camera Obscura. 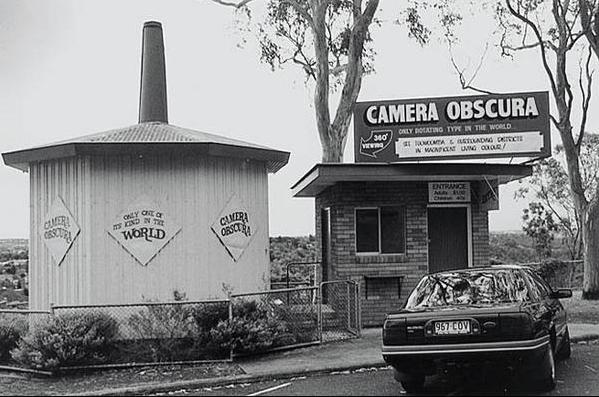 But I remembered another camera obscura from my childhood, the one at Picnic Point near Towoomba. The NLA has a wonderful shot of it by Glen Rees. My googling said that the Picnic Point one had been built by W.M. 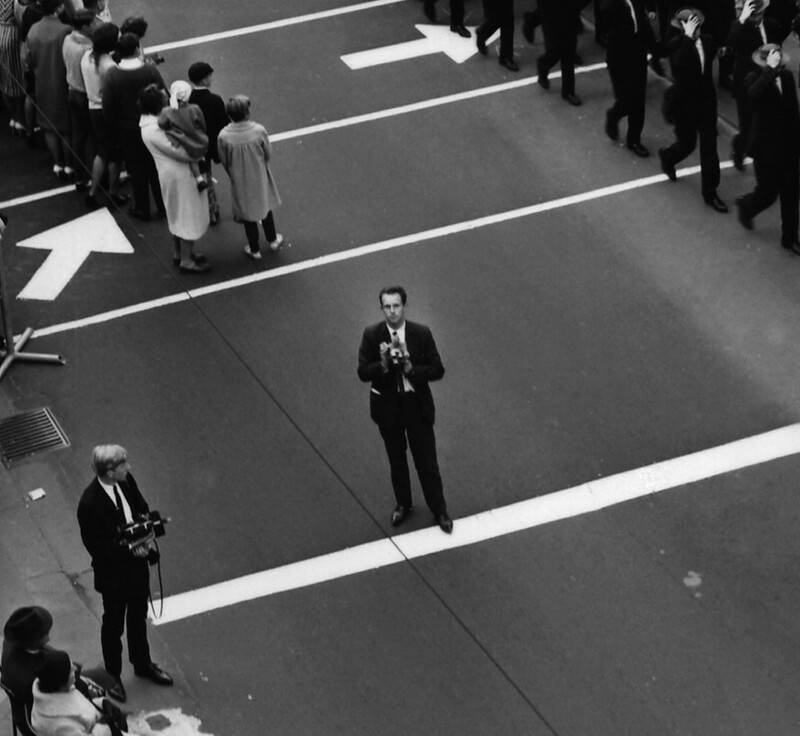 Lowe in 1966, and had a ‘dished’ viewing table. Were each of these room camera obscuras designed and built independently? Or was there a template? Posted on April 18, 2014 by martynjolly. This entry was posted in Blog and tagged 2014, Martyn Jolly. Bookmark the permalink. ← Art Gallery of New South Wales Dark Matter symposium: expand our discussion of the enterprise and the apparatus too!